As pallet buyers, Direct Supply can purchase your surplus or no longer needed wood or plastic pallets. We are actively looking to increase our used pallet inventory to help our customers affordably fulfill their shipping needs. We can help you recycle your used pallets and put them to good use so you can increase the efficiency of your space. Maybe you overestimated how many pallets your company needed or maybe you no longer need as many as you did in the past. By selling them to Direct Supply, you can recoup some of the cost of your initial investment. Be sure you’re getting the best price for your pallets by consulting with us first! We offer some of the most competitive pallet buy back rates in the Chicagoland area. Perhaps you receive regular product shipments on pallets and you’ve accumulated a stockpile of them that are starting to crowd your warehouse. Holding onto them isn’t doing your company any favors, especially since you could be using that space for something that helps your business bring in more revenue. Not only are they taking up space, they may begin to rot and breakdown, exposing rusty nails and splintered wood. This makes old, unused pallets not only a physical hazard, but a potential health hazard as well. Many consumers are excited to work with businesses that make the effort to “go green.” As one of the “Three R’s of Recycling” (reduce, reuse, recycle), selling your used pallets back to a pallet buyer allows others to reuse that pallet without requiring additional forestry resources. Let your customers know that your company is helping the environment by taking part in a sustainable pallet recycling program. Learn more about buying recycled pallets. Direct Supply will buy back your used wood or plastic pallets. Call us (630-345-3913) with details in order to get a quote. Be ready to share how many pallets you’re looking to sell, if they are wood or plastic, the condition of the pallets, their size, your location, as well as any other pertinent information. This information will help Direct Supply provide an accurate estimate of how much those pallets are worth and what price will be fair for them. 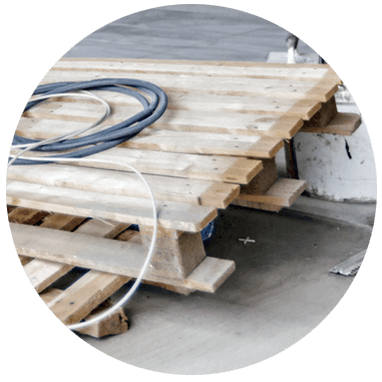 After we receive your old pallets, they are thoroughly inspected and reconditioned, repairing or replacing any broken or unstable components. They are then made available for sale through our used pallet program! Take advantage of Direct Supply’s pallet recycling program! 1 Call, 1 Solution: Your 1 Source for Pallets, Packaging, and More. Contact us today!